This week I had an exclusive story published on the Daily Mail This is Money website. Within a few hours The Times had contacted the subject of my story and written their own version for the next day’s paper and website. A similar thing happened to me back in April when Telegraph Women published my exclusive interview with Professor Svanborg, a scientist trying to cure cancer through breast milk. About a month later the story suddenly sprung up on Mail Online, The Sun, Lad Bible, The Metro, The Independent ,and the New York Post. So what, you might say. News organisations copy and cannibalise stories from each other all time. Many stories are not news unless they have been covered by somebody else first. 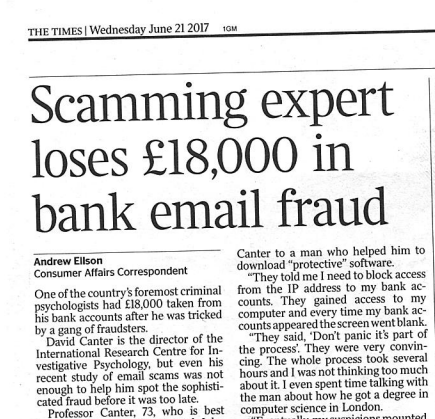 But the thing that irked me was that I had pitched the fraud piece to The Times several times without getting any response. Similarly I had spent weeks pitching the cancer cure story to many national newspapers to no avail and it was only after much persistence that I secured the commission from The Telegraph. So if these stories were publishable why didn’t anyone respond to my pitches? I understand how news organisations work, before I was freelance I worked for Johnston Press and previously Newsquest. I get that budgets are tight and a story for free is always the preferable option. I also get it that inboxes fill up and great pitches can get lost among the swathes of PR emails. So rather than get mad I have decided to try and learn from this experience and share my thoughts with other freelancing journalists / journalism students. If you know you have a cracker of a story (which I did in both of these cases) be persistent. Follow your instinct and keep plugging away. Someone will commission the story eventually but it is about reaching the right person, at the right time, in the right way. Don’t be afraid to contact someone multiple times. Think news and features. I made the mistake in the fraud story case of pitching it only to newspaper feature sections (Money, Consumer, Personal Finance) because that is who I usually write for. But actually it was picked up by the news desk and published on page 5 of the paper among the daily news stories and not in the money section. Pitch sideways. If one part of a news organisation says no, or more likely doesn’t respond to your emails / calls, then pitch it to another section in the same organisations. Just because health doesn’t want it doesn’t mean women or science won’t. Keep adding to your contacts list. In this case I have gathered the names and contact details of all the reporters who did follow up my story even though they didn’t commission the original piece. Next time I know who will be interested in this type of story and even if they are not a commissioning editor they will know who is. Mention your original story when pitching. To get someone’s attention mention that you are the journalist who landed said story first and since they followed it up would they also be interested in this other story, which this time they can have exclusively before anyone else. And finally, accept that news organisations have their own reporting staff and will always want content for free but that doesn’t mean you should work for free. Value yourself and your work. Believe in yourself and keep plugging away.